Pineapple Lily Red (Eucomis comosa ) Glorious red stems and long lasting flowers makes this Pineapple Lily a real winner in the garden or the vase. 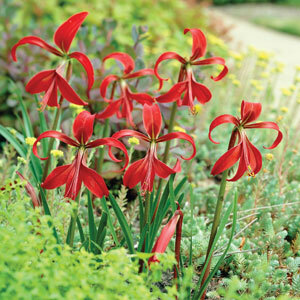 Large bulbs and an excellent multiplying habit will mean you have a fantastic display very quickly. 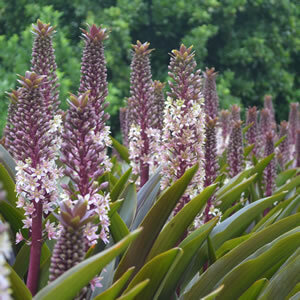 Pineapple Lilies are hardy easy to grow and look amazing when grown en-masse or as a border. Dormant during the Winter months and coming to life in late Spring, the Summer blooming flowers have an extremely long life making them ideal in large tubs as specimen plants or in clumps in the garden bed. Prefers a full sun to part shade position. Planting Width: 25 – 30cm. Depth: Level with or just under the soil surface. General Information: Very hardy plant with unusual and attractive flowers. Suitable for all climates. Soil: Rich, well drained soil. Watering: Normal watering is required during dry periods. Fertilising: Work through a well rotted animal manure, blood and bone or complete fertiliser before planting. Pruning: Remove spent flowers. Leave undisturbed for many years. If lifting, do so after the foliage has died back, remove offsets. Store in a cool dry and airy position before replanting in Spring. Likes: Being undisturbed, wet soil. ✔ Ideal for Large Tubs. Tips: Cut flowers last up to 6 weeks in a vase.